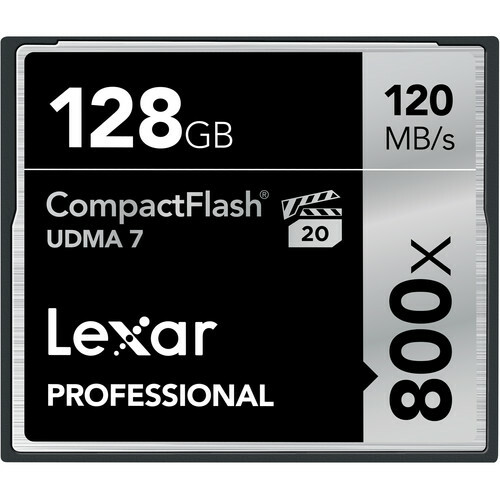 The Lexar 128GB CompactFlash Memory Card Professional 800x UDMA 7 is a high-performance CompactFlash (CF) memory card with a data storage capacity of 128GB. It harnesses UDMA 7 technology to deliver an 800x speed rating, enabling maximum sustained read speeds of 120 MB/s, with write speeds of up to 75 MB/s. The card is compatible with UDMA CF and CF devices. Capture and save still photos and full HD 1080p and 3D video with your DSLR camera. The CF card supports VPG-20 for capturing professional-quality, full HD movies at up to 20 MB/s. When paired with a UDMA 7 enabled reader (not included), the card offers super-fast file transfer to computer, drastically accelerating your workflow. Image Rescue 4 software, available via free download, lets you recover lost or accidentally deleted photo and video files. Enjoy free professional tech support. The card is backed by a limited lifetime warranty. Box Dimensions (LxWxH) 5.3 x 4.0 x 0.7"
128GB CompactFlash Memory Card Professional 800x UDMA 7 is rated 4.8 out of 5 by 20. Rated 5 out of 5 by Anonymous from Works in the D810 I should have expected an expensive camera to need an expensive card. I bought and returned 4 CF cards from reputable manufacturers and none of them would format with my D810. First I thought it was a defective card, then after four cards of different brands, I thought it was my camera and after reading on-line that others had similar problems I discovered the D800's had the problem too, and so went all in and bought this card. I'm sure it will have great write speed and will perform better than I will ever need. Bottom line if you want to use a CF card in a Nikon read the manual for the approved cards and do not deviate from their list. Rated 3 out of 5 by Jim from Promo Code Doesn't Work I just purchased 6 of Lexar's 128GB CF cards with their Image Rescue software bundled in as part of the deal. However, when I attempt to download the software using the supplied code, the site says that the code doesn't work.Since I had 6 different codes (from the 6 cards) I tried them all and none of the codes worked. Rated 5 out of 5 by Eric Saperstein from Fast, so far so good Early rating, so far so good, had it about a month. Fast, easy, simple - it's a media card not that much else to write! Rated 5 out of 5 by DUSTIN from Lot of bang for a buck Not as fast as some of the new higher speed cards but for the cost this card works GREAT for those long events where a high speed card is not needed. This card can handle the speed of a burst from my 1d-x without buffering (I've pushed it a time or three). I'd buy another for the price. Rated 5 out of 5 by Charles from Quality Storage! Great deal from B-H on this high capacity Lexar card. I use it in the second slot of my D810 Nikon. No complaints, make a photo and it writes to this card. Done deal. Rated 5 out of 5 by Cookie from Great card. It's a good card, like sandisk. But I found this card to have a more tighter fit than the sandisk CR counterpart. It fits but it's just tighter. Rated 5 out of 5 by clarence from Just what I needed Hands down a wonderful investment, now I don't worry about have to change cards when I do a shoot. Rated 5 out of 5 by Tony B. from Great card great price! 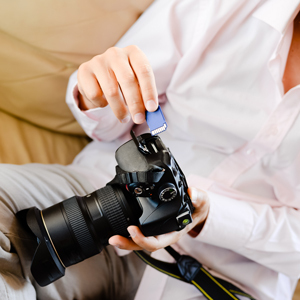 Great card for the photographer that do not hold the button down! Great card for a great price! Can i write 4k video on 5d mark 4?